It’s damn hard to enjoy a thriller when you don’t, won’t, can’t believe a word of it. 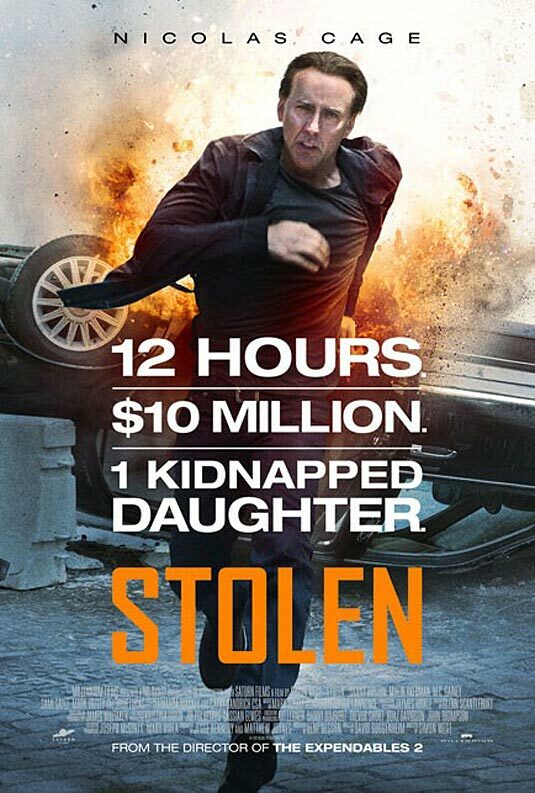 Case in point: “Stolen”, a truly dreadful movie starring non other than Nicolas Cage. If you loved “Ghost Rider”, “Next”, “Bangkok Dangerous”, “Drive Angry”, “Trespass”, “Season of the Witch” and I dare you to say you did, you’ll marvel that Mr. Cage has done it again. He plays a career criminal who goes to jail for a long time following a heist-gone-wrong that appears to have left his partner Josh Lucas dead. But when he leaves prison, he discovers that…wait for it…Lucas is still alive and has kidnapped his daughter. Lucas threatens to kill her unless Cage can come up with the $10 million stolen in the heist that sent him to jail in the first place. I may be making “Stolen” sound like more fun than it is. Trust me, it isn’t. The real bad guy in this flick isn’t Lucas; it’she soul-sucking devil of modern cinema: Hollywood formula. “Stolen” should be rated S for Stupid.